I love that time of the year, with its reading statistics. 2012 was a fantastic reading year, with 89 books reads, and 17 listened to = 106, my highest ever, I believe [total of 2011 = 99]. 17 [16 in 2011]. This is an average of 1.4/month. Total of 11,536 mn [=192.26 hours] with an average of 31 mn/day. I could add 3 books I translated. – 12 by Shakespeare, 4 by Dorothy Gilman, 3 by Kate Morton, 3 by Agatha Christie, 2 by Italo Calvino, 2 by Michelle Moran, 2 by Keigo Higashino, 2 by Fred Van Lente. Re-Reads: 3 [4 in 2011] : Le Grand Meaulnes, Macbeth, Othello. Longest: Ascetical Homilies of Saint Isaac the Syrian – 567 pages. Which authors new to you in 2012 that you now want to read the entire works of? I began the day with Rebecca. but I made sure to stop at The Secret Garden. In the office, my boss said : Bring Up the Bodies ! and sent me to research The End of the Affair. then went back to my desk Remembering Babylon. before saying goodnight to The Orphan Master’s Son. Now don’t tell me this is not fun! Have you tried with the titles of the books you read in 2012? In 2012, I participated in 25 Reading Challenges, 4 Read Alongs, and 3 Tours. see my recap here. The most fascinating reading challenge was Around the World in 52 countries. I have signed up to only 12 Reading Challenges, 2 being challenges I started in 2012 and plan to finish this year! I will take part in more virtual book Tours, already 4 are lined up, more to come I’m sure. I’m excited to take part in the Proust Year, and will read the whole of A la recherche du temps perdu, to celebrate the 100th anniversary of its publication. I’m also thrilled to start the challenge of reading one book per US State. See this Google spreadsheet to see what titles I plan to read for what challenge – so far, only a few titles are listed, but that can give you great ideas of Challenges. 2012 was such an exciting year of reading for me, thanks to you other book bloggers, and all my readers who subscribed to this blog through email, google reader, wordpress, facebook, twitter, linkedin, pinterest, etc, and to all your comments! Thanks again for following this blog! This entry was posted in Audiobooks, ebook, Fiction, Graphic-Novels, Historical novels, Non-Fiction, Read in and tagged year in reading by WordsAndPeace. Bookmark the permalink. Wow, that’s an impressive list of books in one year. I would have to give up work to read that many….. Like the Google spreadsheet idea of keeping track. For Italy, who are you thinking of? There is the series featuring the Sicilian detective that everyone is raving about which I think is Inspector Cavelleri. …. thanks. I actually did not give up work, but the TV! my husband and I spend 4-5 hours reading daily after supper. this is the only times when I read. for Italy, I think I may read Lamberto, Lamberto, Lamberto, by Rodari: http://www.goodreads.com/book/show/12217784-lamberto-lamberto-lamberto, or some other books by Italo Calvino, whom I enjoy a lot. Wow now this is a year end wrap up! I am particularly impressed with all of the different countries your authors were from this past year. Here’s to a fabulous 2013! I love statics too, even thought of studying economy just for statics! Pie charts and graphs??! This is so awesome – I am seriously fangirling over this post! thanks, maybe you could try it for next year? it is so much fun, but only if you keep track as you read along each book, otherwise it’s too long to do at the end. Charts! I love them! The date the book was published chart is awesome. I want to do one of those in the future, although I know it was skew absurdly towards 2010-2012. Happy reading and blogging in 2013! I love that you kept track of hours – this gives a great perspective on how regular, small chunks of time can add up to a hefty total at year end. isn’t it? if you count the time you spend doing the dishes, etc – of course won’t work if you have a dishwasher, but am lucky enough not to have one, so great excuse to listen to audiobooks! 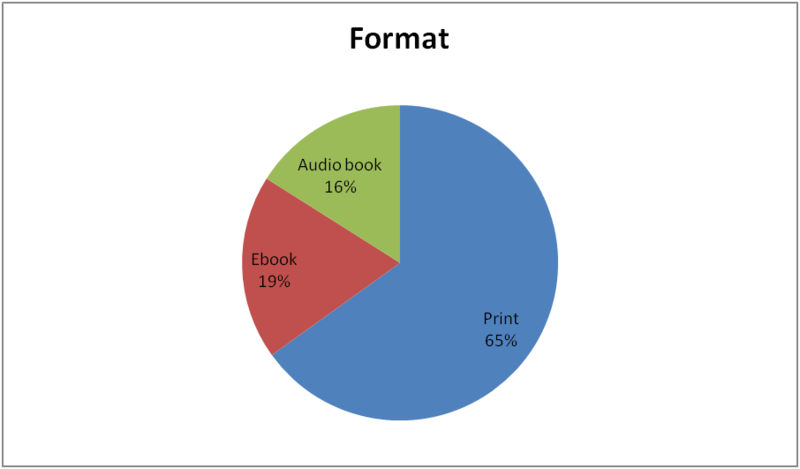 What’s your preferred source for audiobooks? I’ve been relying on the free ones from LibriVox. I think I only listened to Lilith on Librivox, the narrator was awesome, like a professional. I think my main source is my library, I can download directly from my library website; and sometimes I get audiobooks on CDs from there that I transfer to my ipod touch, easier for me to read. another source is publishers, for instance you can ask Simon & Schuster audio, they send you a list and you can request up to 4 per month, that you have to review [I’m forwarding their last email to your gmail address]. Fabulous – thanks so much! Loved reading this with all the fun visuals!!! I’ve been eyeing a few of those titles in your best of lists. Can’t wait to eventually get to them! That was exceptional for this year, with so many countries visited. Happy reading year as well. Great Stats. I would like to read “Little Princes” too. Reading 30% of non-fictions is a great thing. I hope to emulate that next year. Have a good 2013! Thanks. yes Little Princes is amazing, but watch out, you may want to pack for Nepal right away! I thought The Forgotten Garden was a wonderful audio book and I loved Little Princes also. Happy New Year, yes great books! Love those charts and graphs! I am no where near that organized. I only know number of pages read because goodreads tells me so. I’m almost finished with Flight Behavior and it’s already one of my favorites for the new year. wow, I’m glad you begin 2013 so well, with Kingsolver! You’ve had a great year of reading! It’s great how much you keep track of too – I should get better organized, I love those sorts of statistics, but I’ve fallen behind on recording everything this year. Wow, all of Proust plus all that other stuff? You have a great year of reading ahead. I love your pie charts and graphs too! How fun. Wow!!!! That is impressive.. Love the graphs. I mentioned this when you commented on my blog but that’s awesome how you recapped and reviewed your year in reading! Pie charts and everything 😀 Looks like you had an awesome 2012 in reading, hope it continues into 2013. I would love to get to Black Count this year. I really liked the other book I read by Tom Reiss. I’m glad it was a favorite of yours! wow, thanks for the recommendation! Looks like I stupidly never paid attention to any other possible book by him. just read the synopsis of the Orientalist, really intriguing! so now on my TBR! Holy wow, talk about by the numbers! Do you keep stats throughout the year, or wait until the end to compile and dissect everything? I add to my stat sheet after each book, otherwise it’s insane at the end of the year. 2012 was a great reading year for you. I love the graphics as well.